I love a greasy spoon as much as the next person; the fat which coats your mouth with meaty flavours and the seasoning of the pork which has been cooking in it. You can't beat it. The slightly greasy tables that shine with the gloss of the previous customers splatter. I find it all quite quaint, and what someone would consider quintessentially British. Oh how the tourist sees it. Perhaps I see my local greasy spoon, as a tourist who considers everything purposeful and not accidental (like mish mashed chairs). Either way, the no-frills nature of places like this allows the cafés grub to speak for itself, and no harm intended, but you don't go in to marvel at the (lack of), decor. Chris's café of Digbeth, although new, has a 'been there' quality about it. Instead of polished seats, it's very much a café in the style of a 1970's East End 'caff'. 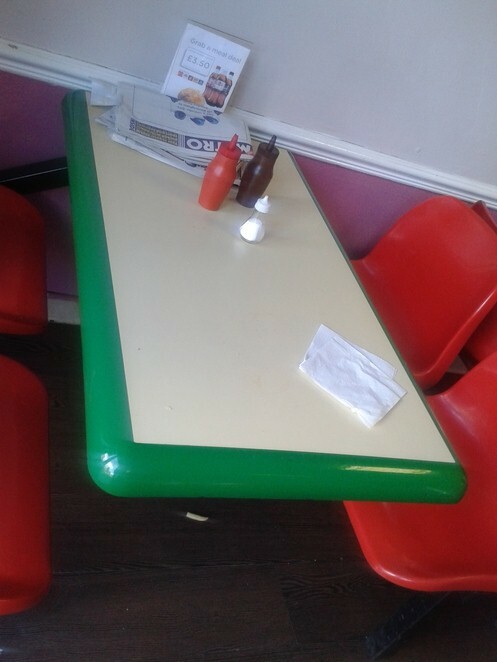 Seating is in a traditional 1970's style, with bright primary colours as a nice shot of colour, and on the tables are compulsory condiments of salt, pepper, tomato ketchup, and vinegar. What establishes it as 21st C, however, is the service. Owner Chris is behind the til with a huge smile on his face. Once I'd placed my order and waited in a seat for its arrival, I watched Chris meet and greet every customer with the same gusto and smile of a man whose confident in his position. Chris was in his element serving customers, he's clearly a customer-service kind of guy, who seemed to bounce off every customer, and thrive on their energy. In short, he was in his element, and that is a rarity in the hospitality industry. The food is a mix of simple British classics and familiar café grub. Breakfast is sold all day and starts at £2.00. I enjoyed a jacket potato however, with cheese beans and a side salad. It only coat £2.30 and filled me up much better than an overpriced sandwich I can buy at the other cafes in the city. 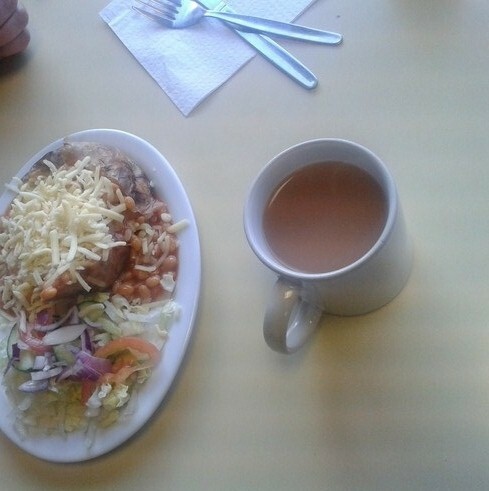 My jacket potato really hit the spot, and served with a cup of tea I felt like I was at home. The café is mercifully placed next to the National Express coach station, which is truly a blessing. Countless times have I been on the verge of what I considered starvation because of the lack of nearby shops selling hot and filling food. 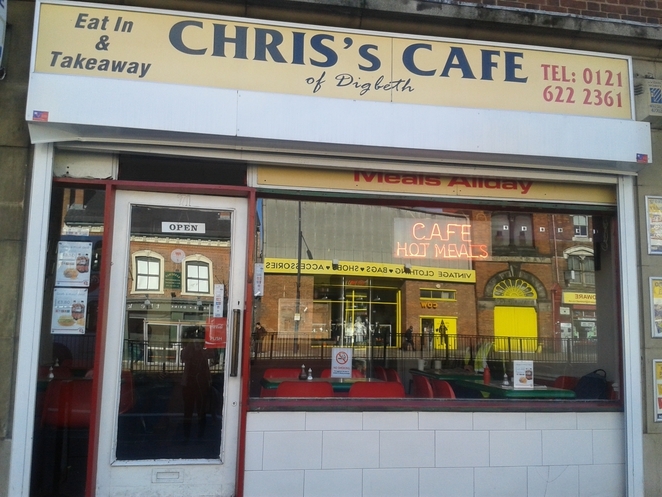 The coach station only has vending machines, but if you're hungry for something more satisfying, walk the one minute journey across the road and dine at Chris's.